A Southern Resident Killer Whale in Puget Sound. Photo courtesy of NOAA. Worried that Puget Sound’s revered orcas are headed for extinction, Gov. Jay Inslee is calling for quick actions to help the whales — including boosting their food supply and reducing underwater noise that could disrupt their feeding efforts. Surrounded by state and tribal officials, Inslee on Wednesday signed an executive order designed to galvanize state agencies into action by the end of next month. The order also creates a new Southern Resident Killer Whale Task Force, which is mandated to develop a strategic plan to improve the chances for the orca population, which has fallen from 98 to 76 animals the past 22 years. The plan must be completed by November. Southern Resident killer whales, which are listed as endangered by state and federal governments, have been experiencing low birth rates, primarily from a lack of Chinook salmon, their primary food, according to experts. Even when the whales are foraging, their ability to find fish through their sonar-like echolocation may be diminished by background noise in the water, as well as by boats in the vicinity, according to biologists. In addition, their immune and reproductive systems are likely to be impaired by toxic chemicals that have built up in their tissues. The new task force will include representatives from a dozen state agencies along with federal, tribal and local governments. The group will offer recommendations for next year’s legislation and state spending along with changes in state policy. A follow-up report at the end of next year will outline the progress. Co-chairs of the task force will be Thomas “Les” Purce, former president of The Evergreen State College, and Stephanie Solien, who serves on the Puget Sound Partnership’s Leadership Council. Leonard Forsman, chairman of the Suquamish Tribe, said state and tribal officials as well as elected officials and average citizens have a “vital mission” to carry out on behalf of the Southern Resident killer whales. It will take sacrifices, he said, to prove that people can coexist with salmon and orcas and other living creatures in the region, but success will mean that sacred creatures will be around for future generations. Commissioner of Public Lands Hilary Franz agreed that intensifying efforts to save the salmon and whales will not be simple or painless, but orcas are awe-inspiring to everyone who has seen them. – By April 30, Washington Department of Fish and Wildlife and the State Parks and Recreation Commission must have a plan to increase enforcement of vessel regulations and education for people watching the whales this summer. – By April 30, the Washington Department of Ecology must develop a curriculum to train the crews of commercial whale-watching vessels, who might be the first responders to an oil spill that could further decimate the orca population. – By April 30, WDFW should review fishing regulations with an eye to protecting areas of Puget Sound along with specific salmon runs that could provide food for the orcas. Changes would require the support of tribal co-managers and federal agencies with input from Canadian officials. – By May 31, the Washington Department of Transportation must develop a strategy that could lead to quieter ferries that share the waters with the orcas. – By July 31, Ecology must develop criteria to fund stormwater projects that could reduce pollution affecting the food web, including killer whales. 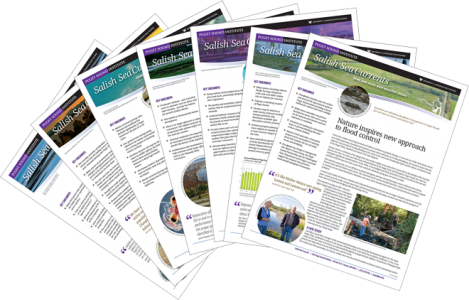 – By July 31, WDFW needs to identify key watersheds for salmon recovery — including revised policies, incentives and hatchery operations. – By Dec. 15, state agencies involved in issuing salmon-recovery grants would propose ways that money directed to salmon-recovery projects could also benefit killer whale recovery. The state supplemental budget, recently passed by the Legislature, contains about $550,000 for increased enforcement and boater education for whale watchers over the next two years. It also includes $837,000 for increasing hatchery production where it will help the orcas and $115,000 to support the governor’s latest efforts in orca recovery. Read a press release about the executive order issued by Gov. Inslee’s office. Does Puget Sound need a diet?